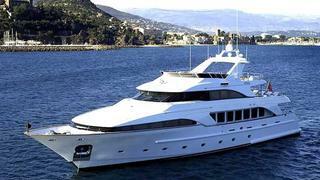 Burgess tells me they’ve now signed the 35m motor yacht Aladina for sale. Built by by Benetti in 2000 as one of the yard’s Classic range, she has undergone a very recent refit and refurbishment of the skylounge. Aladina offers accommodation for up to 12 guests in four to five cabins including a master suite on the main deck with separate dressing room, vanity unit, seating area and his and hers bathroom ensuite. The VIP cabin and two twin guest cabins, all with marble bathrooms en suite, are located on the lower deck. Up to four further guests can be accommodated in the skylounge on two sofa beds, with bathroom en suite. Twin 1370hp MTU engines yield a cruising speed of 11.5 knots and a maximum speed of 16 knots, while Quantum zero speed stabilisers dramatically reduce roll when at anchor. Aladina is asking €4.95 million.